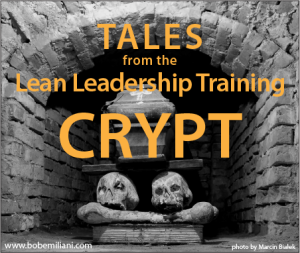 A previous blog post, Learning From Mistakes, described a failed Lean leadership training activity at a large and successful technology company. People liked that story so much that I decided to share another mistake, vintage 2003-2005, which also learned a lot from. The vast majority of the Lean leadership training that I have done with senior executive teams has been very successful. The executives smile, shake my hand, compliment me on a job well-done, and thank me for delivering a lively, informative, and intellectually stimulating training program. Often, they would invite me back to do more training for leaders one level below them, and sometimes leaders a level or two below that as well. The first time this happened, I was a bit hesitant to do the training because the training had been designed, from the start, for level 1 leaders, not for level 2 leaders and below. But, the customer saw value in my work and the customer is always right – right? My customer thought I could help them by expanding the training to lower levels. What could go possibly wrong? Invariably, the follow-on training would happen several weeks or a few months after the level 1 training due to schedule conflicts, etc. Finally, training day would arrive. I introduce myself, explain the objectives of the training, desired outcomes, and so on. I then begin the training, at that time with the aid of PowerPoint slides. I’d get to about slide number 15 and someone would raise their hand and say: “You mean to tell me that our level 1 senior managers when through this exact same training two months ago?” I’d say “Yes, they did.” The look of surprise and then unhappiness immediately came across everyone’s face. Level 2 was unhappy because they had seen no change in the beliefs, behaviors, and competencies of any of their level 1 leaders in the prior weeks or months since they were trained. Then, in some cases, I would train level 3 leaders, and around slide number 15 someone would say: “You mean to tell me that our level 2 managers when through this exact same training two months ago?” It turns out that level 3 leaders had seen no change in the beliefs, behaviors, and competencies of any of level 2 leaders in the prior weeks or months since they were trained. What’s going on here? Level 1 leaders were given clear instructions on what they needed to do differently on a day-to-day basis, how they needed to think, what questions to ask, etc. Why weren’t they doing it? I became more hesitant to do training below level 1. Yet, this outcome occurred a few more times. I pulled the andon cord on my training to study what was happening and identify practical countermeasures. I had structured my Lean leadership training to provide answers to questions that leaders had about Lean leadership. It contained the usual hands-on exercises that adult learners prefer. But, a funny thing happens when you provide answers to people in top leadership position. They think knowing about something is the same thing as actually doing it – and doing it well. But that is obviously not the case. Lean leadership requires commitment to daily practice, almost exactly the same way a person learns to play a musical instrument. Confusing knowing with doing means top leaders do not engage in the daily application of Lean principles and practices. That’s why level 2 people were not seeing any changes in level 1 leaders’ beliefs, behaviors, and competencies. You may have heard the story of how Taiichi Ohno trained people to see waste, unevenness, and unreasonableness. Ohno did not give people answers, tempting as it may have been. Instead, he put people into positions where they had to discover answers for themselves. Doing this results in more substantive and deeper learning experiences, and also motivates people to want to learn more as they discover “the more I know, the less I know” phenomenon that all serious Lean people experience. The mistake I made was to give answers to executives. So, I evolved my Lean leadership training over time from giving people answers to putting leaders into positions of having to discover answers for themselves. As you can imagine, this requires leaders who are truly committed to Lean management. Here is one of their “learn by doing” homework assignments. But, not all leaders are committed. Most just want answers. I still do that type of training because executives see value in getting answers to their questions quickly. But, I no longer train people below the level of top leadership. I tell level 1 leaders that training level 2, level 3, etc., leaders is your job. And, you do that through daily practice, with the help of leadership visual controls (which we create during the training), to develop the beliefs, behaviors, and competencies of characteristic of capable Lean leaders. Level 2, level 3, etc., will soon begin to mirror your new beliefs, behaviors, and competencies. That’s how it works.